Spring is in the air—and for lots of people, that means spring break is right around the corner. If you haven’t booked a trip yet, you can try out our travel insights tool to see flight price trends for popular routes or find out which cities have hotel deals during spring break. If you’re still looking for inspiration on where to go, check out top-trending destinations for spring break in the U.S.—four out of the five cities this year are in Florida. Whether you’re planning a trip within a certain budget or you’re looking for a hotel that fulfills all your needs, here are a few new features in Google Flights and Hotels that will make travel planning easy. If you have flexibility on where you go but not on how much you’ll spend, you can explore the world map on Google Flights to see all the destinations you can fly to on your budget. For example, say you’re in San Francisco and want to spend less than $150 on a flight. For either specific or flexible dates, you can use a price filter on desktop to set your price limit and see only the destinations you can fly to within this range. 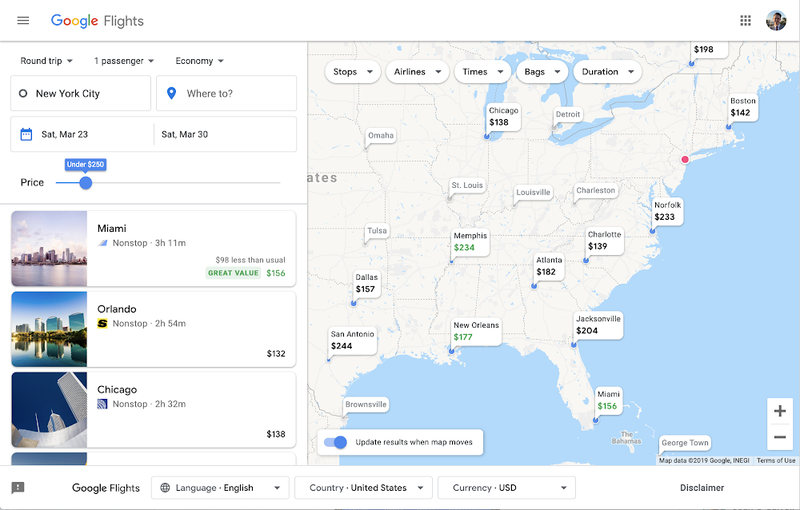 Once you decide on a destination and start looking for flights, you’ll now see a price insight for most trips—a feature previously only available for holiday dates last year—that shows you whether the prices you’re seeing for flights are high, typical or low compared to what you’d usually find. When we know, we’ll also tell you if the price won’t get any lower or if it’s expected to increase soon so you can make the best decision on when to book. Set on your flight but need to whittle down your hotel options? Let’s imagine you’re going to Miami at the end of March, and there are over 300 hotel results for your search. To help you find the right hotel for your trip, apply our new “Deals” filter. This filter uses machine learning to highlight hotels where one or more of our partners offer rates that are significantly lower than the usual price for that hotel or similar hotels nearby. You can also view a hotel’s highlights—like a fancy pool, if it’s a luxury hotel, or if it’s popular with families—with expanded pages for photos and reviews curated with machine learning. Google Maps can also help when it comes to picking a hotel by showing you if a hotel is in a convenient location and near relevant landmarks. Search for hotels near a landmark or point of interest like “Hotels near Disney World” in Google Maps on your laptop. You’ll see several hotel options and their rates, plus the walking and driving distances to your point of interest. Plan your perfect escape this spring with these new tools from Google Flights and Google Hotels.